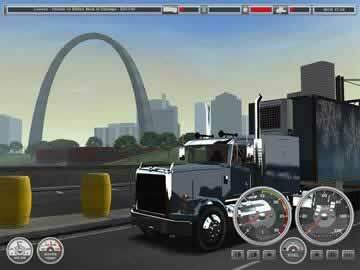 18 Wheels of Steel - Haulin Game Review - Download and Play Free Version! 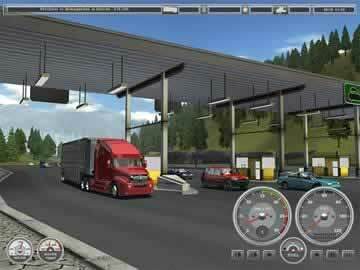 One of the most realistic trucking games ever! Another installment in the popular 18 Wheels of Steel trucking simulation series! 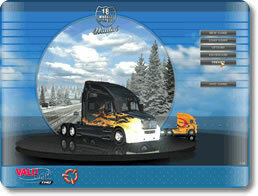 18 Wheels of Steel: Haulin' puts your driving and business skills to the test. What's the best way to make money and get a leg up on the merciless competition? You decide where to go, what deliveries to make, and which trucks to use! If you can obey the rules of the road, you just might make it. A well-simulated game world lets you get a true feel for the open road from the cab of your personalized rig! 18 Wheels of Steel: Haulin' offers more than 35 beautifully detailed trucks, and there are many ways to upgrade and customize your own. You can interact with other characters, even hiring other truck drivers to work for you! Visit 40 American cities all across the country, delivering over 45 unique cargo types! A huge game environment gives you the ability to make your own decisions at all times. Newcomers to the genre will learn the basics in five minutes, but trucking and simulation enthusiasts will also be pleased by the game's depth and complexity. Get the show on the road and download 18 Wheels of Steel: Haulin' now! America is just overflowing with stuff that people all across it want. The only problem is that this stuff is seldom produced where it’s needed most. This is where you come in; in 18 Wheels of Steel: Haulin,’ you get behind the wheel with one enterprising trucker who’s getting ready to start his own business. It’s not going to be an easy ride, though, for you’ve got to deal with traffic, weather, cops, expenses and your own physical needs. Graphically, there’s not much to be said about Haulin.’ Vehicles look as they should, and each one that appears in game is based on a model you can find in real life. They don’t look nearly as real in game, of course, due to simple textures. One thing that’s a particular shame is the fact that the mirrors have no reflection. This is notable because it means you can’t see behind yourself using the rearview mirrors, which renders the first-person view unplayable. It isn’t a huge deal, but being able to play from the perspective of the driver would have made the experience much more immersive. The backgrounds are a mixed bag. On one hand, they’re incredibly varied and designed to be as accurate to the setting as possible. You’ll drive through desert badlands while in Nevada, streets lined with palm trees in Florida, and so on. The same can be said for the cities; things like the Strip and Washington Monument are perfectly visible in Las Vegas and Washington D.C. respectively. There are also some fairly rudimentary weather effects and a day-to-night cycle that gradually changes over time to good effect. However, despite their variety, the backgrounds ultimately aren’t much to look at, being even more bland and lifeless than the trucks. Ultimately, it’s hard to appreciate the scenery most of it is liable to blend together after extended playtime. Drive Down Highways from Coast to Coast! Perhaps, though, the bland graphics can be justified. If there’s one thing that can be said about Haulin,’ it’s that the map is absolutely sprawling! It covers pretty much the entire continental United States, includes over 40 cities, and most impressive of all, is never once split up by any loading screens. You can seamlessly drive from one end of the country to the other, which you might very well do should you take the right job. The roads are appropriately laid out in a realistic fashion and never once does the game force you down a specific path to your destination; you’re free to navigate your own way. Sadly, despite the United States being famed for its varied terrain, all the roads you’ll traverse will always be flat. You won’t be scaling much in the way of hills aside from the occasional ramp. This isn’t a race, it's a simulator. As such, you’re going to be expected to have some modicum of decency on the road. You need to obey traffic laws, avoid running through red lights, and stay on the correct side of the road. In true trucker fashion, you’re also required to get your weight inspected at various checkpoints that litter the map. Failure to do any of this gets you a fine whenever you encounter a cop. This sounds good on paper, but in practice, it’s kind of weak. Just violating the law will get you a fine, whether or not an officer actually saw you. Worse, the game can be quite erratic in docking you for criminal activity. Making a turn into a road with a red light active while your light is green, for example, can very well get you a ticket. This can be especially bad because you may not encounter a cop for some time after a violation, and thus won’t even know that you’ve broken the law until it’s too late. The game ends when you lose all of your money, so you may want to save carefully if you’re running low on funds, lest you accidentally ruin your game due to an alleged misdemeanor. The truck may be the undisputed king of the road, but even it needs to be looked after. Both collisions and basic wear and tear will damage it over time, and you also have to keep tabs on things like your fuel and water temperature. Service stations can refuel and repair your machine good as new, but if you really want to show your devotion to your truck, you also have the opportunity to customize it. There are a wide variety of upgrades available for purchase. You can install new engines, transmissions, brakes and tires, all of which have different effects on your vehicle. They can alter the truck’s speed, mileage, durability, torque, and other things to varying degrees. If that’s not enough, you can also purchase any number of cosmetic accessories and alter the paint job to really make your truck look unique. The amount of customization to be found in Haulin’ is impressive, and it’s very unlikely two players’ trucks will look and perform the same way. Driving on the highway often seems like a long and monotonous process, both in real life and in Haulin.’ Fortunately, the game allows you to listen to music using the on-board radio. Better yet, it doesn’t play any old in-game music, but a custom soundtrack of your own making. It adds a nice personal touch to the whole thing, and can help liven up the experience with a sound that you enjoy. In addition to music, your truck is also equipped with a handy CB radio. This allows you to communicate with your fellow truckers, ask them about weather and traffic conditions, or just chew the fat. It’s not a deep feature at all, but it is a fun one nonetheless, especially since the comments made and heard over it can be amusing at times. Unfortunately for Haulin,’ it should be noted that though it isn’t a bad game by any stretch of the imagination, it’s no longer quite the definitive edition of 18 Wheels of Steel. That would be American Long Haul as of 2012, which includes everything in this game on top the addition of Mexico. Regardless, on its own merits, 18 Wheels of Steel: Haulin’ is a deep game that lets you take control of both the driving and business sides of trucking. If a truck-driving simulator isn’t your kind of thing, it won’t change your mind, but fans of the genre will find a lot to enjoy here, thanks to its branching roads, stretching map, and expansive amount of customization. Player created video showing pickup and delivery of a trailer.